TWU Local 100 is mourning the tragic death of Collge Point Bus Operator Natasha Griffith, who died early in the morning of Wednesday, September 5th. She died in the Parkchester section of the Bronx, a victim of domestic violence. She leaves two children. Private Lines Vice President Pete Rosconi said she will be dearly missed by her co-workers in MTA Bus. There will be a viewing on Wednesday, September 12, 2018 at Jeremiah Gaffney's Funeral Home, 92 Wahl Avenue, Inwood, NY 11096, from 6PM to 6:30, followed by a funeral service from 7 PM to 8 PM. All members are encouraged to attend to pay their respects. Rosh Hashanah marks the first and second days of the Jewish new year. It begins Sunday night, September 9, at sundown. Greetings to all of our Union Sisters and Brothers of the Jewish faith. I wish you a good and sweet year. 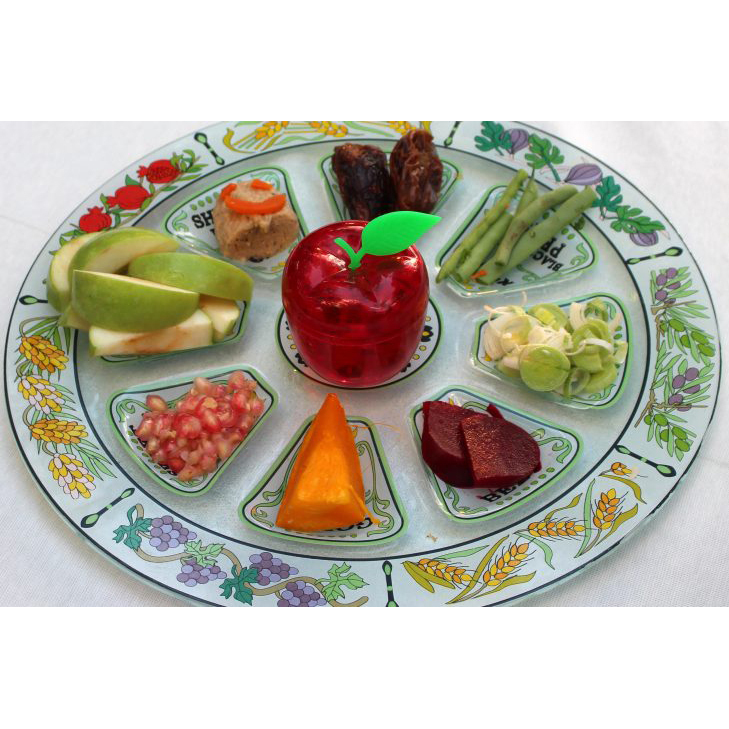 Shanah Tovah. 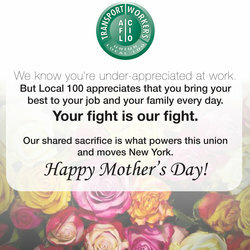 I send greetings to all of our TWU Local 100 members on this holiday weekend. It is our collective labor that allows society to function -- that is nowhere more apparent that in our motto, "We Move New York." Labor Day is the only holiday where we remind ourselves that all professionals, all skills, all labor, are one. This is unity of purpose -- the key always to maintaining and growing our union power. 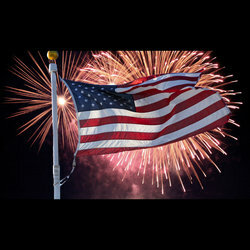 Let us enjoy the fruits of our labor and resolve to keep fighting for a better future for ourselves and our families. 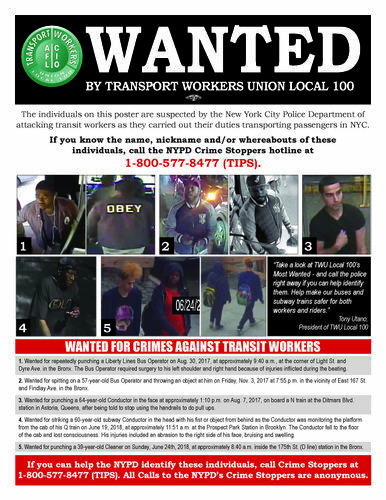 WEDNESDAY, AUGUST 8 -- TWU Local 100 has created its own “Most Wanted” poster with photos of suspects wanted by the Police for attacking transit workers. Union staff and members began distributing the poster – with photographs of suspects – to riders and members today, Wednesday, Aug. 8. The poster features the phone number for the NYPD Crime Stoppers hotline. Callers can remain anonymous. 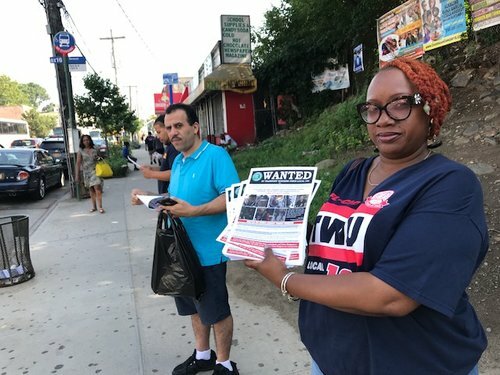 Local 100 handed out approximately 1,000 copies of the Most Wanted poster at the Dyer Ave. subway station in the Bronx and nearby bus stops. A Liberty Lines Bus Operator was beaten on his bus near the station in August 2017. The culprit remains at large. Another 1,000 of the Most Wanted flyers were distributed at the Prospect Park subway station in Brooklyn where a Q-train Conductor was struck in the head with a fist or blunt object last month. Distribution of the poster will continue periodically, Utano said. 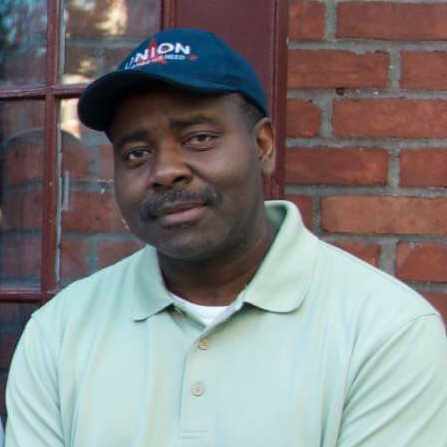 “It’s a good idea,” Denver Thompson, the Liberty Lines Bus Operator attacked in August 2017, said. “Anything that sheds some light on what we face on the job is a good thing.” The cases described on the poster are the only ones with photographs of suspects that the NYPD has released. There will be a viewing from 2pm – 5pm with a service immediately following at 5pm. TWU Local 100 officers and members, especially those from TA Surface and Maintenance in Brooklyn, are mourning the passing of Whitfield Gibson, Chair of the Jackie Gleason Depot since 2006. Brother Gibson died early Monday morning, July 23, 2018, after a difficult battle with cancer. He was only 50 years old. 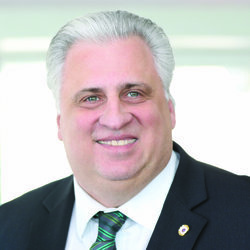 Word of his passing spread quickly around the union, prompting a flurry of heartfelt comments from officers and members about his dedication to the union and to transit workers. 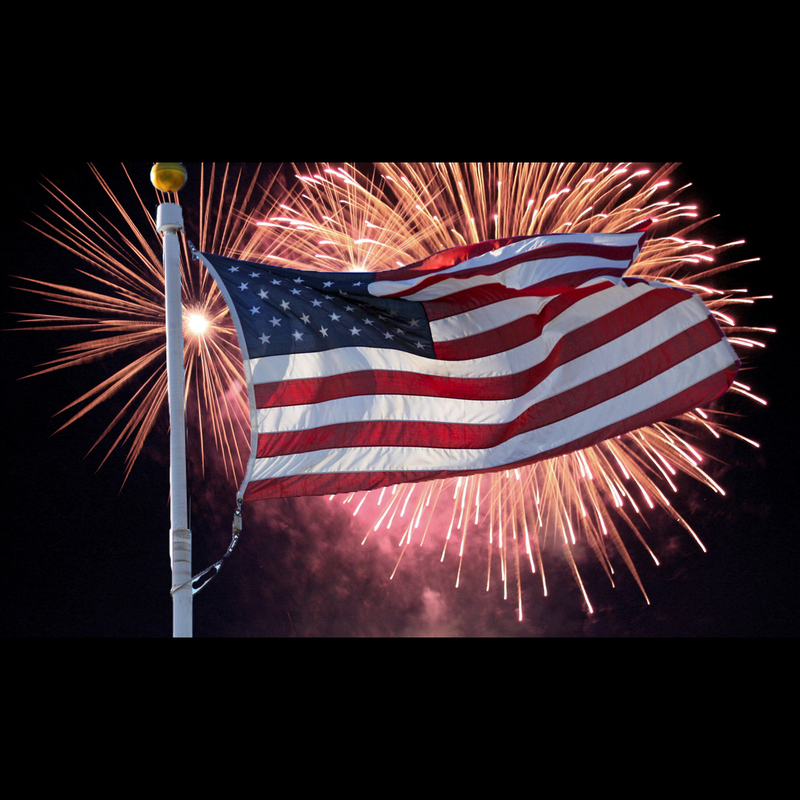 TWU Local 100 wishes our 44,000 members, families and friends a very Happy 4th of July. If you are lucky enough to be off and able to relax and have fun with your family, give a thought to your Brothers and Sisters who are on the job keeping our great City moving. 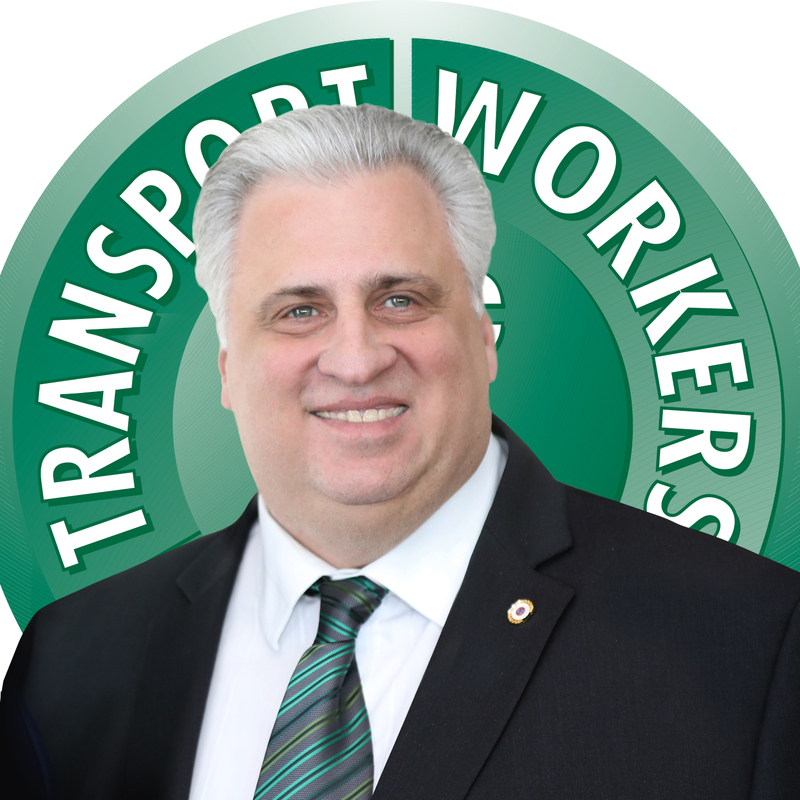 Transit workers provide a vital service to New York and the entire region. 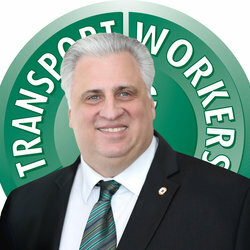 TWU Local 100, We Move New York! When I think back to my first encounter with the union, I have to laugh. I was all of 19 years old. I got a job with the Transit Authority as a Power Maintainer Helper right out of Grady Vocational High School in Brighton Beach. So I’m at one of my first union meetings and I’m complaining loudly about, what else, overtime. Remember, I’m on the job for about a year. I extend greetings on behalf of our union leadership on the occasion of Mother’s Day. Women are an increasingly important part of the transit workforce as barriers continue to fall in what used to be male-dominated industries. Women operating trains and buses are now commonplace, and now in our trades titles, women are operating heavy equipment. 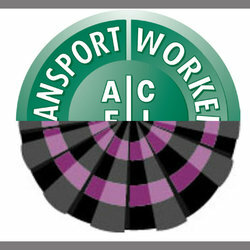 Many flaggers, who provide safety throughout the system, are women. 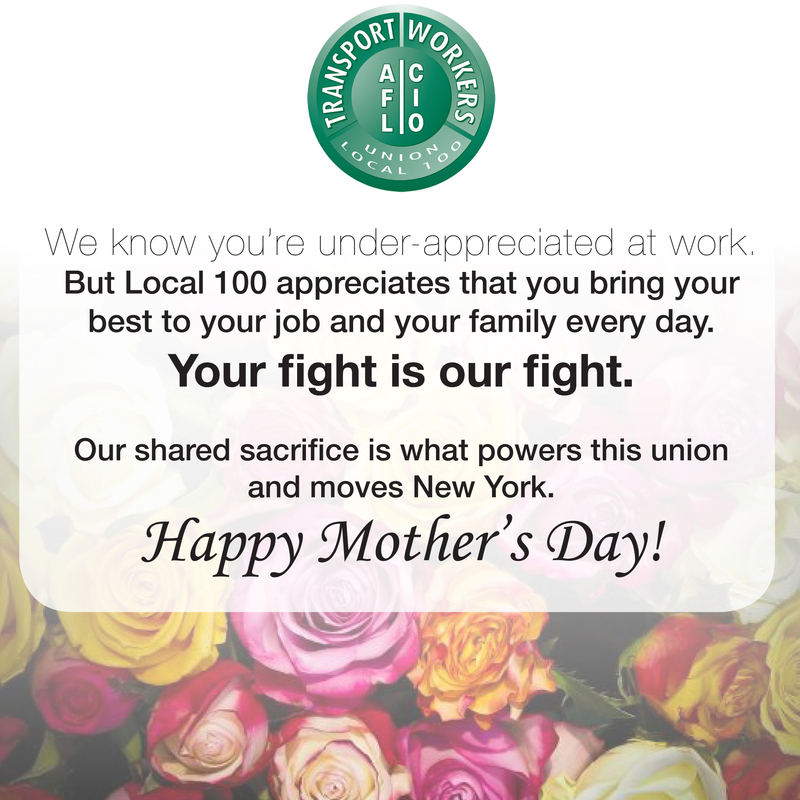 As a result, motherhood has become a concern and a responsibility of TWU Local 100, and recent bargaining sessions have established new protections and rights for expectant mothers and new mothers. I say, this is long overdue and I am proud to be a part of moving these initiatives forward. On a personal note, just last month I welcomed my first grandchild, a daughter, and my daughter-in-law, Nanci, is a proud first-time mother. My grand-daughter, Nina Fay, is entering a world in which more opportunities are open to her – thanks in no small part to what our labor unions have accomplished. We will keep that momentum going. President Utano Statement on the 50th Anniversary Of the Assassination of Dr. Martin Luther King, Jr.
“Today the 43,000 members of TWU Local 100 join all Americans of good will in marking the 50th Anniversary of Dr. Martin Luther’s King’s death on April 4, 1968 as he fought for the dignity of striking sanitation workers in Memphis. As we honor Dr. King’s great legacy, let us all in TWU commit ourselves to redoubling our efforts for equality in our workplaces and in society at large not just for our own brothers and sisters in TWU, but for people across America and throughout the world. Dr. King’s final speech on April 3, 1968 where he declared that he had “been to the mountaintop” continues to inspire us today to keep up the good fight for equality. Let us pause for a moment during this important anniversary to remember the great leader who was taken from us 50 years ago, but to also recall his achievements in building the foundation for fairness in our country. Dr. King's address to the TWU's International Convention in 1961 is a proud part of our union's history. You can read it here.